Demolition has begun on a Loyola-owned apartment building right next to Regis Residence Hall in preparation for a new Loyola residence hall set to be opened in 2020. The demolition, which is estimated to take six to eight weeks, comes about a week after Loyola’s Alumni House was torn down to make way for the new $47 million building. 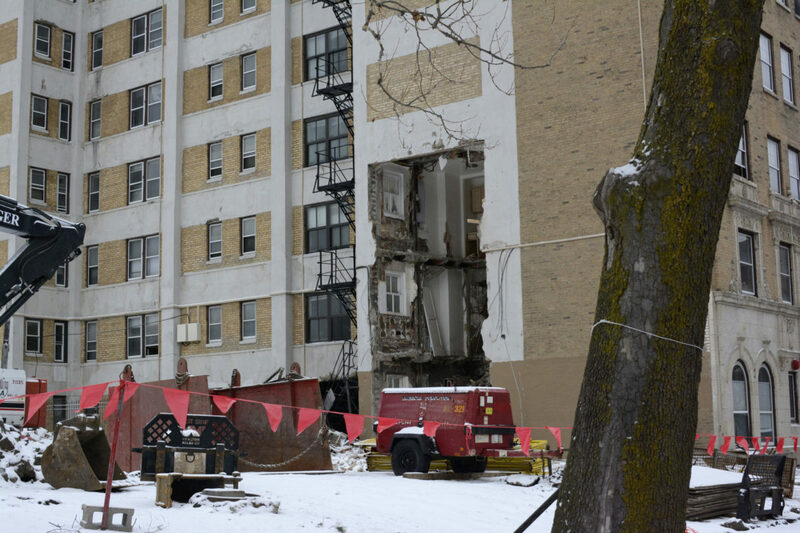 For some Loyola students, such as 21-year-old psychology major, Michaela Johnson, the demolition meant they were forced to move out of the 6330 N. Winthrop Ave. apartment building. Johnson said she first found out about the move over Easter break when her roommate said a letter had been slid under their door. The letter said they would need to move out either at the end of their lease or they could enter a “new, short-term lease agreement” giving them until Dec. 15, 2018 to move out. Johnson said she and her roommate decided to leave at the end of their lease on June 1 so they wouldn’t have to find a new apartment in the middle of their senior year. Johnson said she had been excited to live in the same place for her last two years at Loyola and even declined other housing offers in the spring of her junior year because she wanted to stay in the same place. “Towards second semester of my junior year a lot of my friends were moving and I was so excited that I didn’t have to move … for the fourth time in four years,” Johnson, now a senior, said. Loyola spokesperson Evangeline Politis confirmed a letter was distributed to the building’s 63 units by Lakeside Management on April 2, 2018, notifying residents of the building’s upcoming demolition. The follow-up letter also gave residents the option to transfer to a new building in the area through Lakeside Management, which Politis said 14 residents opted in to. Johnson said she and her roommate reached out to Loyola-managed Lakeside Management about what they felt was a very last minute notification. However, according to Politis, Lakeside Management’s timeline was in accordance with Chicago ordinance. “As the city of Chicago’s ordinance requires only 30-day notice, Lakeside Management went above and beyond that by communicating on April 2 that tenants could extend their lease anytime up until December 15,” Politis said, on behalf of Lakeside Management. The new residence hall will bring additional housing to first and second-year students, offering needed rooms as Loyola’s existing residence halls have struggled to accommodate continually growing class sizes, The Phoenix reported. It will be called St. Joseph’s Hall, named after St. Joseph’s University, a Jesuit, Catholic university in Philadelphia. 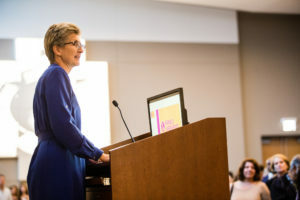 The university’s plans for demolition of the apartment and neighboring Alumni House also received some criticism from the Edgewater Historical Society and other groups, who cited environmental and affordable housing concerns. In a past interview with The Phoenix, co-chairman of the historical society’s historic sites committee, Leroy Blommaert, said he was disappointed but not surprised that Loyola went forward with the project. He added he isn’t aware of any further action the Historical Society will take to counter the demolition. “The fences are up, the contract is signed and I don’t think there will be any last hour reprieve,” Blommaert said on the demolition of Alumni House. Construction of the new residence hall is set to take around 18 months, according to an email sent by Residence Life to students living in the residence halls surrounding the construction site on North Winthrop Avenue. Work is set to begin at 8 a.m. during the week but workers might be at the site earlier, the email said. Some weekend construction will also be necessary during certain phases of the project. Loyola sophomore Sarah Bruns lives in Regis and said the ongoing demolition process has been a disruption. “My room is facing the window looking out on the building that they are currently tearing apart right now, so [I] definitely can hear all of the commotion and everything going on,” the elementary education major said. She said while she’s normally up by the time work starts, which she said is around 7 to 8 a.m., the noisy work wakes up her roommate. Sophomore Mariana Vazquez also lives in Regis but said the demolition hasn’t really impacted her time spent in the residence hall. Students living the area should expect noise and dust related to the construction over the next couple months, the email said. Residence Life asked students to report any construction-related concerns to them. Jane Miller is a sophomore studying journalism and political science. She is currently an assistant news editor for The Phoenix after a year as a news writer. From Seattle, Washington, Jane enjoys exploring the Pacific Northwest on foot, bike and ski.